If you are a swimming pool owner, you have either experienced the frustration of having a leak or it is just a matter of time before you do. Unfortunately, there are many places where a swimming pool could leak. It is important to understand the most common places that a pool may leak, and the process that you need to follow to help you narrow down the location of the leak. You may need to eventually call your local pool professional to repair the leak, but you can save some money on the front end by following the leak detection process below. There are several common places that a swimming pool may leak. The pool may be leaking at the equipment pad, through the plumbing underground, or somewhere in the shell of the pool (like the pool light, wall returns, skimmer or main drain). However, it is important to first rule out evaporation as a possible water loss culprit. There are three steps to follow when determining where your pool may be losing water. Bring pool water to normal level. 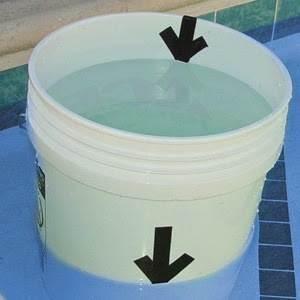 Fill bucket with pool water to about one inch from the top. Place bucket on the first or second step of the pool. Mark water level on the inside of the bucket. Shut off the pump and mark the pool water level on outside of bucket. Turn the pump on for 24 hours. After 24 hours, compare the two water levels. Fill the swimming pool up so that the water level is mid-tile or mid-skimmer. Mark the water level by placing a mark on the tile line or inside the skimmer shell. Turn the pool pump on, but first make sure any auto fills are off. Leave the pool pump running for 24 hours. After 24 hours, return to the pool and observe the water level. If the water level has dropped below the mark you made the previous day, then you may have a leak in the plumbing. Before moving on to the next step, you will need to check the “backwash line” while the pump is running in the filter position to make sure there is not water leaking out of that line. If you are losing water from the backwash line then you need to repair or replace your multiport valve on your filter. Fill the swimming pool up so that the water level is mid tile or mid skimmer. Turn the pool pump off, but first make sure any auto fills are off. Leave the pool pump turned off for 24 hours. If the water level dropped below the mark the same amount as it did during the “24 Hours ON” test, then you now know that the leak is in the shell of the pool. If the water level did not drop, or only dropped a fraction of the amount it did during the “24 Hours ON” test, then you know that the pool is most likely leaking somewhere in the plumbing, not the shell. Once you have identified where the pool may be leaking, it may be best to contact a leak detection expert and share with them your findings. We do recommend that you consult with your local pool professional as they will be able to provide you with additional insight that may help you determine the next steps to repair the leaks in your swimming pool. To find your local ASP – America’s Swimming Pool Company professional, visit our Locations page and make the call today! Thinking about closing your pool this winter? A Halloween Treat!